Barney Stinson is one of the most awesome characters in the history of television. And there is much that teachers of the present age can learn from his ways. 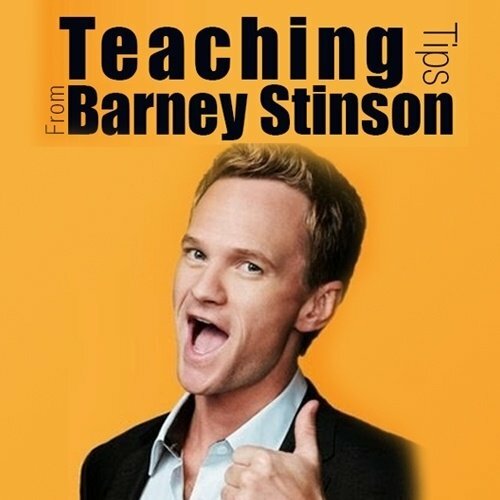 Here are some real time tips for teachers from the legendary Barney Stinson himself. For everyone who has ever seen the popular sitcom, How I Met Your Mother, Barney Stinson is someone instantly recognizable. One of the most popular characters of the series, Barney is loved (and detested) by everyone. The very first words that Barney ever said to Ted were, “Ted, I’m going to TEACH you how to live.” Well, while the debate is still open to whether Barney taught Ted how to live, but I certainly learnt a lot from him.Well, putting aside the narcissist and mildly sociopathic tendencies, there are a lot of positive habits about Barney that can benefit a teacher while he/she is teaching a class. Here are some tips coming from the most Legen-wait for it-dary person on the planet. SUIT UP! While teaching is not considered a job where one needs to look glamorous, unless you’re in a Hollywood movie, it’s always good to look your best when taking a class. Dressing up in your finest clothes will not only make you feel all the more confident but it will also help you in creating a better impression on your students. Barney Stinson’s secret to his success is his “Suiting Up” which always helps him to approach any situation with the confidence required to solve it. Though taking it to his extreme of sleeping in a suit-like pajama might be too much, you can always dress well to make a good impression on your students and fill yourself with the confidence you need to deliver an amazing lecture, every time. THE PLAYBOOK! One of the greatest assets that Barney has in helping him pull off crazy tricks, gambits and flim-flams is his PLAYBOOK. This “book” has enabled Barney to pull off some of the most outrageous cons in the world, like the “Lorenzo von Matterhorn” and the “Scuba Diver”. Having a plan in every situation helped him to accomplish what no one else could. Teachers need to do the same whenever they enter the class. While it is always important to keep an open mind and be ready for any situation, having a plan of action will help you deliver lectures that will help your students learn better. GO ONLINE! One of the greatest reasons for Barney’s success is his effective utilization of technology to get what he wants. From his blog and video resume, all the way to the use of technology in his “plays”, we can see that he is a man who is aware of all the technological advancements available to him and how he can use them to his benefit. Teachers need to learn from this. While teachers often find it quite difficult to head out into the great big ocean of online teaching, this is one of the greatest tools they have at their disposal to teach students from all over the world. WizIQ is an online teaching platform that will provide you a great opportunity to reach out and find students who are interested in taking your class. Their features are designed to streamline the entire process so that you can only concentrate on teaching. As Barney states in his oldest rule, “New is always better!”, it is important to keep up with advancements in the teaching world and going online is the new thing on the block. MIX IT UP! Whoever spends even a little bit of time with Barney can certainly confirm that he is one of the most interesting person to have around. With him no one can be sure of what they are going to do in the near future. Be it “Licking the Liberty Bell” or “Hanging out with Korean Elvis”, he always knows how to make a night memorable. While some of it can be bordering insanity but everyone can safely assume that without Barney’s shenanigans, Ted’s stories would have been quite boring. As a teacher, you too must learn to mix up your teaching in class. Your aim in every class should be to make it memorable for your students, as that will help them learn better. By mixing it up, you can ensure that your students will never call your class boring but will always look forward to the something different that is going to take place in your class. BE AWESOME! Finally, this last bit of advice is something that not just teachers but everyone can benefit from. The only person who knows you best is you yourself. So, you are the only person who can show the world how awesome you are. Barney Stinson is not just awesome because of his suits and his style but he is a talented person with a wide range of skills. From juggling swords and designing websites to hibachi cooking and creating stories out of thin air, he is talented at a wide range of activities.